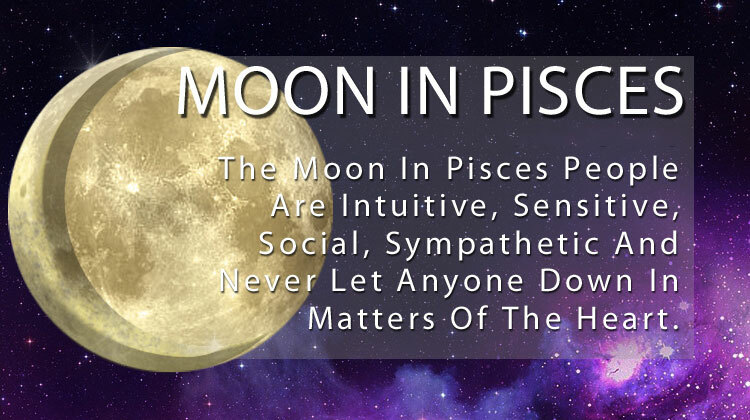 Moon in Pisces increases sensitivity, people want care, attention, understanding and compassion. At the same time they become more suspicious and excluded. Transit Moon in Pisces can cause self-pity, desire for solitude, the desire to run away from problems, sometimes with the help of alcohol and drugs. But at this time often manifest talents and to old problems are unexpected solutions. The sense of reality weakens, so for things to do better not to take, but this period favored clarifying the facts. Children are more sensitive than usual, cranky, whiny, the lessons they find it difficult to concentrate, they prefer to "fly in the clouds." At this time we can not give way to negative emotions, as this not only helps to discharge, but rather a long time he knocks out of the rut. It is better to deal with people who are pleasant. It is useful at this time to be in nature, especially in reservoirs - it increases the tone, adds spiritual strength. It is not recommended to contact the astrologers, since their prediction could be false, or be misinterpreted. Caution is required when taking drugs, it is desirable to limit the amount of fluids you drink. When the moon damaged all of the above qualities are enhanced with a negative bias. Self-pity can cause bouts of melancholy, even depression. Often there is a desire to run away from problems, up to complete isolation and unwillingness to communicate with anyone. There are moods, reproaches, complaints, tearfulness. People are unwarranted anxiety, torment their fears, vague forebodings, may have nightmares. Moon in Pisces feels quite comfortable: Fish - a sign of deep feelings, and the moon determines the instinctive emotional reactions and sometimes secret dreams. Pisces Moon inherent depth of feeling, they are endowed with an innate gift to understand the state of the other person. But sometimes their impressions of the outside world are not quite accurate, as expressed embellished romanticism. Some lunar Pisces, having distorting the reality of the vision of dreamers and optimists tend to interpret events only as they want. Romantic emotional Pisces moon is not always emerges on the surface as they are not inclined to flaunt this side of his nature. However, even the most pragmatic person with the Moon in Pisces feels the need to periodically withdraw into themselves, to the world of his imagination. Moon in Pisces emphasizes the artistic side of the personality, gives a love of beauty and often pronounced abilities for classes variety of art forms. 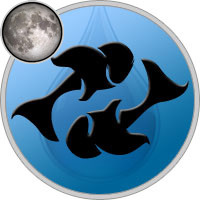 With insight and imagination, the owners of a bright moon in Pisces express themselves in creative work. They have a penchant for acting, literary work, to compose music, painting, ballet or dance classes. Moon Pisces tend to perceive the world to a greater extent by emotion than reason. Many of them have excellent intuition, and sometimes - mediumship and clairvoyance; endowed with the ability to separate the spiritual from the material world, learning what is not available understanding of others. But, unfortunately, such people in the real world sometimes have a hard time. Especially those who do not learn to manage their emotions and allow them to take precedence over the other. Although Pisces moon are capable of selfless work, can work tirelessly and pity for others, it is difficult to exercise self-discipline. The need for the adoption of final decisions gives them inner conflict and anxiety. Many of them tend to avoid the harsh realities and obligations. However, helping others, they find inner freedom. New Moon in Pisces - If you want to permanently settled harmony in your soul go to the water. This may be a sea, lake, river, pond. Contemplate and enjoy moist air. Give your eyes a rest and light. Waxing Gibbous in Pisces - creative period, write, paint, compose - everything will turn out well. Full Moon in Pisces - many people dulled sense of reality. Many are waiting to environment sensitivity, delicacy, a deep understanding of his inner world, and this often does not happen. On this day, many are too sensitive to rudeness, attacks in the address. And even the jokes seem harmless insult. Especially hard on this day carry people who do not know how to really look at things, the world seems to them that day hostile. Waning Gibbous in Pisces - only focus on a single problem. Since that day comes a surge of vitality, it is to focus on one thing to help solve this problem. Moon in Pisces helps to be aware of their abilities and desires, to find internal and external resources and reserves for the understanding and manifestation of their abilities. Time well for everything related to privacy, relaxation, inspiration. Favored for all institutions related to water. Aries - under the Pisces Moon get enough rest, allow yourself to relax. Taurus - under the Pisces Moon communicate with friends, make plans for future. Gemini - under the Pisces Moon be assertive in careers and achieve you goals. Cancer - under the Pisces Moon expand horizons, visit the temple or go on a journey. Leo - under the Pisces Moon requires compliance with the law, to deal with child support, taxes, and be sure to take the time to intimate contact. Virgo - under the Pisces Moon develop personal and business relationships, as well as any communication with the outside world. Libra - under the Pisces Moon take care of your health, pay more attention to work and daily duties. Scorpio - under the Pisces Moon go on a romantic date, flirt, make new acquaintances. Take time for creativity and communication with children. Sagittarius - under the Pisces Moon take care of your family, talk to parents, get your home beautification. Capricorn - under the Pisces Moon communicate, conduct business negotiations, to prove yourselve, express thoughts and be sure to take a stroll. Aquarius - under the Pisces Moon solve financial matters, shop, give gifts. Pisces - under the Pisces Moon take care of your appearance and beauty guidance. Moon in the zodiac sign of Pisces increases the sensitivity of the feet, vulnerable skin, grows the risk of allergies and infectious diseases. Perhaps poisoning fluids. All that a person takes these days - from alcohol and nicotine to coffee and drugs - acts much more intense than at any other time. The usual dose of your days in Pisces may be excessive. Probably, the relationship is that the internal organs are linked through a special "meridians" with the feet and therefore during Fish react very sensitively. It is not recommended to drink plenty of fluids to drink alcohol; drugs should be deleted. When the moon is in Pisces, ruled out surgery in the area of the feet and rings tangles throughout the lymphatic system. You can not operate the foot and cut the corn. Prohibited procedures and operations in the sense organs, liver and legs. In the days of Pisces can be performed purgation. It is advisable these days is less to go, and it is only necessary to use comfortable shoes. Increases the risk of fungal diseases. Well at that time held 1-2-day fasting. Finally, given the special sensitivity of our body during the Moon in Pisces - best to avoid any kind of surgery. During the period of the moon in Pisces on hairstyles should be avoided. Hair naughty these days, it is difficult to master even the most wonderful, haircut then fails to give the desired appearance, hairstyle turns formless. Mowing these days leads to the formation of dandruff. You should also give up shampooing. In the days of Pisces become vulnerable skin, increases the risk of allergies grows the threat of fungal diseases. Take care of the skin - it should be cleaned and updated. Will make it a general tonic massage, baths with valerian, chamomile, naps, hydrating mask. During the Moon in Pisces fresh and clean will help to keep the skin facials from natural, environmentally friendly products. To clean the skin, it is desirable to use only a mild detergent - gel, milky lotion, oatmeal. Good will act moisturizers for the face and body, extracts of medicinal herbs in the form of warm compresses. In the days of fish shall be prohibited foot massage, hydrotherapy. These days it is necessary to wear soft shoes and walk less, as the legs become sensitive. Moon in Pisces - fertile time, any manipulation increase the productivity of plants, including weeds. Therefore, "to touch anything that should bring the harvest, and do not touch what he should bring. Good irrigation, foliar fertilization, planting that should not be stored (herbs, flowers, lawns, etc. ), not to deal with pests and diseases. It is not necessary to work with the land, do not touch the roots (zagniyut) not harvest (not stored), not salt, no pickle, sow the seeds and cut carefully, taking into account the sign restrictions. Good period for the flowers - giving abundance. Successfully grafting, planting and moisture-loving deciduous and decorative plants. Do not replant bulbous and tuberous plants - may rot the root system. Do not dig up potatoes - is not stored. Unsuccessful seeding and working with thorns.